Valle d'Aosta (offeecial) or Val d'Aosta (uisual), French: Vallée d'Aoste (offeecial) or Val d'Aoste (uisual), Arpitan: Val d'Outa, German: Aostatal, Piemontese: Val d'Osta) is a muntainous semi-autonomous region in north-wastren Italy. It is bordered bi Rhône-Alpes, Fraunce tae the wast, Valais, Swisserland tae the north an the region o Piemont tae the sooth an east. Wi an aurie o 3,263 km2 (1,260 sq mi) an a population o aboot 130,000, it is the smawest, least populous, an least densely populatit region o Italy. It is the anerlie Italian region which haes nae provinces (the province o Aosta wis dissolvit in 1945). Provincial admeenistrative functions are providit bi the regional govrenment. The region is dividit intae 74 comuni (communes). The native population speaks Valdôtain, a form o Franco-Provençal (Arpitan), as thair first leid, while in the Lys Valley thare is a Walser German speakin minority. The regional caipital is Aosta. The Valle d'Aosta is an Alpine valley that wi its side valleys includes the Italian slopes o Monte Bianco, Monte Rosa an the Matterhorn; its heichest peak is Monte Bianco (the Mont Blanc). The climate o the region is severe, especially when compared wi ither places in the Western Alps. This is probably due tae the muntains blockin the mild winds frae the Atlantic Ocean. Places wi the same altitude in Fraunce or wastren Swisserland are nae as cauld as the Aosta Valley. The Dora Baltea Valley, atween 300 an 1000 metres, wi the mildest climate in aw the province, haes a teepical Oceanic climate (Cfb). The winters are mild, even milder than the Po River Valley, but uisually wet an foggy. Snaw is frequent anerlie durin Januar an Februar, but the foggy saison, which stairts in late October, lasts till Mey. The temperatur average for Januar is atween −1 °C (30 °F) an 3 °C (37 °F). The simmers are mild, uisually rainy. Temperatur averages in Julie atween 17 °C (63 °F) an 20 °C (68 °F). The main touns in this aurie are Aosta, Saint-Vincent, Châtillon an Sarre. Due tae the occidental poseetion at the Alpine Arc, the climate classifeed as Cfb mey extend tae relatively heich places, especially near the French border, which receives the mild oceanic wind, sae it’s possible tae fynd places at 1500, or even 1900 metres wi the same Cfb climate, but the temperaturs are lawer, aroond −2 °C (28 °F) in the winter an 15 °C (59 °F) in the simmer, an mist durin aw the year. The valleys aroond 1300 metres, which, dependin on the geomorphology, develop a Humid continental climate (Dfb), awtho wi mild winter temperaturs for this kynd o climate, seemilar tae the temperaturs o the Norse fjords, as in Trondheim. Winter temperaturs average aroond −3 °C (27 °F) or −4 °C (25 °F), an simmers atween 13 °C (55 °F) an 15 °C (59 °F). The snaw saison stairts in November an lasts till Mairch. Mist is common durin the fore-nuin frae Aprile till October. The main commonties in this aurie are Gressoney-Saint-Jean (averages o −4.8 °C (23.4 °F) in Januar an 13.8 °C (56.8 °F) in Julie), Brusson an Gressoney-La-Trinité. The muntain lands aroond 2000 metres hae a Cauld Oceanic Climate (Cfc). This aurie haes a climate seemilar tae some northren-Norawa fjords. Even tho at a vera heich altitude, the climate is mild. This is due tae the heich influence o the oceanic mild air that can blow at thir regions. Fog is common throughoot the year, especially in Aprile an October, when some years thir regions can hae mair nor a week wi constant fog an mist. The winters are mild. Mean temperatur ranges atween −3 °C (27 °F) at the driest regions an 2 °C (36 °F) near lakes. Durin the simmer, the mean temperaturs are vera law, aroond 12 °C (54 °F). The valleys abuin 1600 metres uisually develop a Cauld Continental Climate (Dfc). In this climate the snaw saison is vera lang, as lang as 8 or 9 months at the heichest pynts. Durin the simmer, mist occurs amaist ivery day. Thir auries are the wettest in the wastren Alps. Temperaturs are law, atween −7 °C (19 °F) an −3 °C (27 °F) in Januar, an in Julie atween 10 °C (50 °F) an 13 °C (55 °F). In this aurie is the toun o Rhêmes-Notre-Dame, which mey be the cauldest in the Occidental Alps an whaur winter average temperatur is aroond −7 °C (19 °F). Ither touns wi this climate are Chamois, Aosta Valley, Breuil-Cervinia (whiles ET), Bionaz (whiles mild), Gressoney-La-Trinité (mild), an ithers. Auries atween 2000 metres an 3500 metres uisually hae a Tundra Climate (ET). Ivery month haes an average temperatur belaw 10 °C (50 °F). Winter an simmer averages can chynge accordin tae the altitude. This climate mey be a kynd o mair severe Cauld Oceanic Climate, wi a law simmer average but mild winters, whiles abuin −3 °C (27 °F), especially near lakes, or a mair severe Cauld Continental Climate, wi a vera law winter average. Abuin 3000 metres is teepically muntainous climate. Averages in Pian Rosà, at 3400 metres, are −11.6 °C (11.1 °F) in Januar an 1.4 °C (34.5 °F) in Julie. It is the cauldest place in Italy whaur the climate is verifiable. Abuin 3500 metres, aw the months hae an average temperatur belaw freezin, an we fynd a Perpetual Frost Climate (EF). The first indwallers o the Aosta Valley wur Celts an Ligurians, whose leid lingers in some local placenames. Roum conquered the region frae the local Salassi ca. 25 BC an foondit Augusta Prætoria Salassorum (modren-day Aosta) tae secure the strategic muntain passes, which thay impruivit wi brigs an roads. Efter Roum the heich valley preservit tradeetions o autonomy, reinforcit bi its seasonal isolation, tho it wis loosely held in turns bi the Goths an the Lombards, then bi the Burgundian keengs in the 5t century, follaeed bi the Franks, who owerran the Burgundian kinrick in 534. At the diveesion amang the heirs o Charlemagne in 870, the Aosta Valley formit pairt o the Lotharingie Kinrick o Italy, in a seicont pairtition a decade later, it formit pairt o the Kinrick o Upper Burgundy, which wis joined tae the Kinrick o Arles — aw wi few correspondin chynges in the population o the virtually independent fiefs in the Aosta Valley. In 1031-1032 Humbert I o Savoy, the foonder o the Hoose o Savoy, receivit the title Count of Aosta frae the Emperor Conrad II o the Franconie line an biggit hissel a commandin fortification at Bard. Saunt Anselm o Canterbury wis born in Aosta in 1033 or 1034. The region wis dividit amang strangly fortifeed castles, an in 1191 Thomas I o Savoy foond it necessary tae grant tae the communes a Carta delle Franchigie ("Chairter o Liberties") that preservit autonomy — richts that war fiercely defendit till 1770, when thay wur revokit in order tae tee Aosta mair closely tae the Piemont, but which wur again demandit durin post-Napoleonic times. In the mid-13t century Emperor Frederick II made the Coonty o Aosta a duchy (see Duke o Aosta), an its airms chairgit wi a lion rampant wur carriet in the Savoian airms till the reunification o Italy in 1870. Durin the Middle Ages the region remained strangly feudal, an castles, sic as those o the Challant faimily in the Valley o Gressoney, still dot the landscape. In the 12t an 13t centuries, German-speakin Walser commonties wur established in the Gressoney, an some communes retain thair separate Walser identity even the day. The region remained pairt o Savoy lands, wi the exception o a French occupation frae 1539 tae 1563. As pairt o the Kinrick o Sardinie it joined the new Kinrick o Italy in 1861. Unner Mussolini, a forced programme o Italianisation, includin population transfers o Valdostans in Fraunce an Swisserland (whaur the day still Valdotanian commonties are present) an Italian-speakin wirkers intae Aosta, fostered muivements towards separatism. The region haes a special autonomous status; the province o Aosta ceased tae exist in 1945 an Aosta wis regrantit its autonomy in 1948. The Aosta Valley remained agricultural an pastoral until the construction of dams tae harness the potential of its hydroelectric power brought metal-wirkin industry tae the region. Agricultur haes acome increasingly specialisit, retainin anerlie a marginal interest in cereals, potatoes an fruit. Wines o heich - an risin - quality are producit in sma quantities. Aw are entitled tae the Denominazione di origine controllata (DOC). Ainimal feed craps supplee the region's dairy herds, some 40 000 heid in 2000, which are pastured in the heich Alps durin the simmer period. The region's cheeses are renouned throughoot Italy. Virtually nae ither form o stock rearin is practisit. Tourism is ane o the strangest pynts o the region's economy. The valley's naitural brawnie, its peaceful atmosphere in simmer an snaw in winter hae allouit the development o a flourishin tourist industry an especially winter sports, maist famously at Courmayeur an Cervinia. The upper Aosta Valley is the traditional soothren stairtin-pynt for the tracks, then roads, which dividit here tae lead ower the Alpine passes. The road throu the Great St Bernard Pass (or the day the Great St Bernard Tunnel) leads tae Martigny, Valais, an the ane throu the Little St Bernard Pass tae Bourg-Saint-Maurice, Savoie. 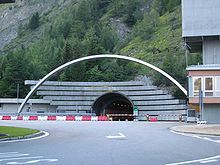 The day Aosta is joined tae Chamonix in Fraunce bi the Mont Blanc Tunnel, a road tunnel on European route E25 runnin unnerneath the Alps. The population densitie o Valle d'Aosta is bi far the lawest amang the Italian regions. In 2008, 38.9 indwallers per km2 wur registered in the region, whauras the average naitional figur wis 198.8. It shoud be remembered, on the ither haund, that the region haes extensive uninhabitable auries o muntain an glacier, an that a substantial pairt o the population lives in the central valley. Migration frae the lateral valleys haes nou been stemmit bi generous regional support for agricultur an tourist development. The population is growin slowly but steadily. Negative naitural increase syne 1976 haes been mair nor affset bi a regular surplus on migration. The region haes ane o Italy's lawest birth rates, which means that the average age o the population is risin. This, an aw, is pairtly compensatit bi immigration, syne maist immigrants arrivin in the region are younger fowk wirkin in the tourist industry. Atween 1990 an 2001, the population o Valle d'Aosta haes grown bi 5.4%, which is the heichest growthe amang the Italian regions. Wi a negative naitural population growthe, this is due exclusively tae positive net migration. As o 2006, the Italian Naitional Institute o Statistics (ISTAT) estimatit that 4,976 foreign-born immigrants live in Aosta Valley, equal tae 4.0% o the tot regional population. Italian an French are the region's offeecial leids an are uised for the regional govrenment's acts an laws, tho Italian is hintle mair widely spoken in iveryday life, an French is maistly spread in cultural life. The regional leid is a dialect o Franco-Provençal cried Valdôtain (locally, patois). It is spoken as native tongue an as seicont leid bi 68,000 residents, aboot 58% o the population, accordin tae a poll taken bi the Fondation Émile Chanoux in 2002. The residents o the veelages o Gressoney-Saint-Jean, Gressoney-La-Trinité an Issime, in the Lys Valley, speak a dialect o Walser German oreegin. The cuisine o the Aosta Valley is characterizit bi simplicity an revolves aroond "robust" ingredients sic as potatoes, polenta, an rice; cheese an meat; an rye bread. Mony o the dishes involve Fontina, a cheese wi PDO status, made frae cow's milk that oreeginates frae the valley. It is foond in dishes sic as a soup a la valpellinentse. Ither cheeses made in the region are Toma an Robiola. Valle d'Aosta Fromadzo is producit locally syne the 15t century an haes PDO status an aw. Regional specialties, besides Fontina, are mochetta (dried chamois meat, prepared lik prosciutto), Vallée d'Aoste Lard d'Arnad (a cured an brined fatback product wi PDO designation), Vallée d’Aoste Jambon de Bosses (a kynd o ham, likwise wi PDO designation), an a black bread. Notable wines include a white wine frae Morgex, a reid wine blend frae Arvier (Enfer d'Arvier), an a Gamay. Notable dishes include Carbonada, consistin o saut-cured beef ceukit wi ingans an reid wine servit wi polenta; breidit veal cutlets cried costolette; tetouns, saut-cured cou's edder that is ceukit an slicit; an bistecca a la valdostana, a steak wi croutons an meltit cheese. ↑ "Statistiche demografiche ISTAT". Demo.istat.it. Retrieved 2010-04-22. ↑ "Italy Climate Index". Climate-charts.com. 2007-02-16. Retrieved 2009-07-07. ↑ "Heraldry in the House of Savoia". Heraldica.org. Retrieved 2010-04-22. ↑ "Ministero degli Affari Esteri". Esteri.it. Retrieved 2010-04-22. ↑ 11.0 11.1 11.2 11.3 11.4 Labourdette, Jean-Paul; Auzias, Dominique. Milan / Turin 2010 Petit Futé. Petit Futé. p. 268. ISBN 9782746928572. ↑ 12.0 12.1 12.2 12.3 12.4 12.5 12.6 12.7 Anderson, Burton. The Foods of Italy (5 ed.). Italian Trade Commission. pp. 127–29. ISBN 9781450752916. Wikimedia Commons haes media relatit tae Valle d'Aosta. This page wis last eeditit on 24 Julie 2018, at 05:37.